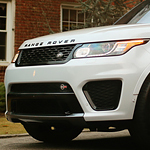 If you are in the market for a luxury SUV, the Range Rover Sport is a popular model at Land Rover Fox Valley. Many consumers choose this model because it offers a number of innovative features that enhance performance and capability. The Range Rover Sport comes with Dynamic Response. This feature significantly improves the vehicle's handling with hydraulic roll control, and it also maximizes on-road performance and passenger comfort. Dynamic Response can deliver increased low-speed agility and boost high-speed stability. It also provides optimal steering precision for a smooth ride. There are two engines offered with the Range Rover Sport, which include a 4-cylinder engine and a Supercharged V6 engine. The 4-cylinder engine can produce up to 254 horsepower and 443 lb.-ft. of torque and is paired with a ZF-8HP70 transmission. The Supercharged V6 engine can reach up to 340 horsepower and 332 lb.-ft. of torque. This engine is paired with a ZF-8HP45 transmission.